Having discussed and illustrated the value of using the camera in Manual Mode I return, full circle, to my question at the beginning of this series. Are YOU an artist if you do’t use the “M” mode? Well, as long as you stay out of the “P” mode you can still be an artist if you did have an original idea, executed it in say aperture priority, and you did achieve the result you pre-visualized. What I’m trying to impress on photographers is that like painters we should control all the variables that effect the final image for us to truly be the authors of our images. I believe those that just select the “P” mode, push the shutter button, and settle for the result are very close to those “artists” who used those paint-by-numbers kits in the past. I always have, and still pick, every variable that goes into my art because there’s always a reason behind each choice. There’s always a reason I pick a certain ISO/f-stop/shutter speed combination. Maybe the above is one definition of an artist: And if you have no reason to (or lack the ability to) pick the fundamental components that affect the final image then…You’re NOT yet an artist in my book. 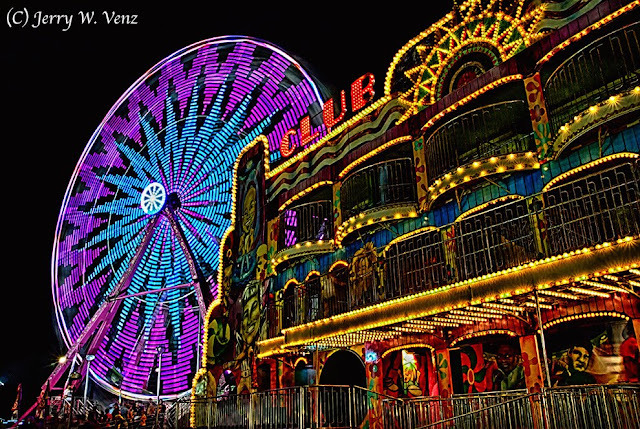 Here is an example of picking every variable to create the image I had pre-visualized, in this scene, at our State Fair…. Usually Focal Length is the first decision I make. The focal length you choose is the most important artistic decision in photography! It determines how much is seen. It determines what kind of distortion (extension or compression distortion) will be used, if any. After the base line metering of my light, for basic exposure, I pick my ISO. For this scene I did not want the super high ISO because I knew there would be a lot of night sky in my image that would be underexposed thus creating a lot of noice. For this image Shutter Speed was the most important creative, exposure variable. I wanted that ferris wheel to be a vibrant piece of spinning art! But, at the same time I wanted detail in it. I’ve never been a fan of when photographers hold their shutter open so long the the ferris wheel is just a blurry, bright, blob. And for this image, because I included a large piece of foreground (using its “lead-in lines”), using that fun-house building, I knew I needed a lot of depth-of-field to keep everything sharp. Therefore, I needed a small aperture. I think my lens choice and where I placed my camera made this image. By being closer to the funhouse building, with my lens at 20mm, the wide focal length’s extension distortion warped the lines of the building making it point into the ferris wheel. In addition the placement of the ferris wheel, in my frame, using the compositional rule of thirds made this image different and, I think, more interesting than a ferris wheel all by itself. So, as you can see there was a lot of thought behind this image—as well there should be! My challenge to you: Pick something, like the ferris wheel, that everybody photographs and put your own spin on it (pun intended!). Do it differently….Show me your results! And, Stay in the mode of “M” !